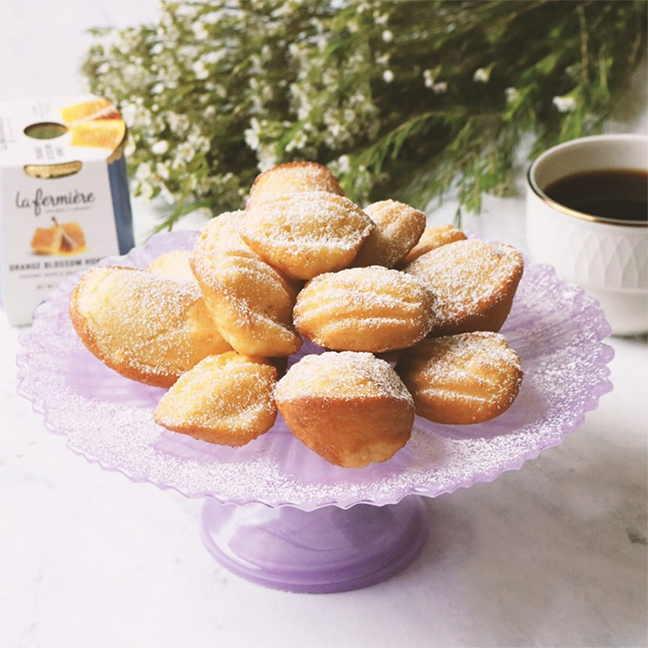 Madeleines, also known as French butter cakes, are small shell-like shaped cake cookies originating from the northeastern regions of France. These petite delights can be enjoyed with tea in the morning or after a meal as a tasteful dessert. Follow these simple steps outlined below to enjoy. (1) Grease Madeleine mold with some soft butter and set aside. (2) Gently whisk egg, then add in sugar into it. Whisk till sugar dissolved. (3) Add in La Fermière Orange Blossom-Honey yogurt and whisk vigorously until batter becomes foamy. (4) Then gradually add in sifted flour and baking powder into batter mix till combined and becomes a thick paste. (5) Lastly add in melted butter in two batches and mix well. (6) Scoop batter into mold with a spoon. (7) Bake at preheated oven 350 degrees for about 15 minutes or skewer inserted comes out clean. (8) Remove Madeleines from mold and place on wire rack to cool.